Did You Grow Up in a Barn? Well, did you? Because if you did you may be familiar with leaving the barn door open! I’ve always loved that saying. It’s great for yelling at your kids when they don’t close the front door behind themselves. Personally, I would love to live in a barn, but that’s not what this post is about. Anyway, as an adult I had a house with a pocket door and I really liked it. They are wonderful space savers! But now we have another alternative to the pocket door. It’s the barn door! Yes, you may leave it open! When it is open it looks great, and it’s out of the way. When you close it, it’s sleek and flush with the wall. Barn doors allow us to put doors where we otherwise couldn’t. 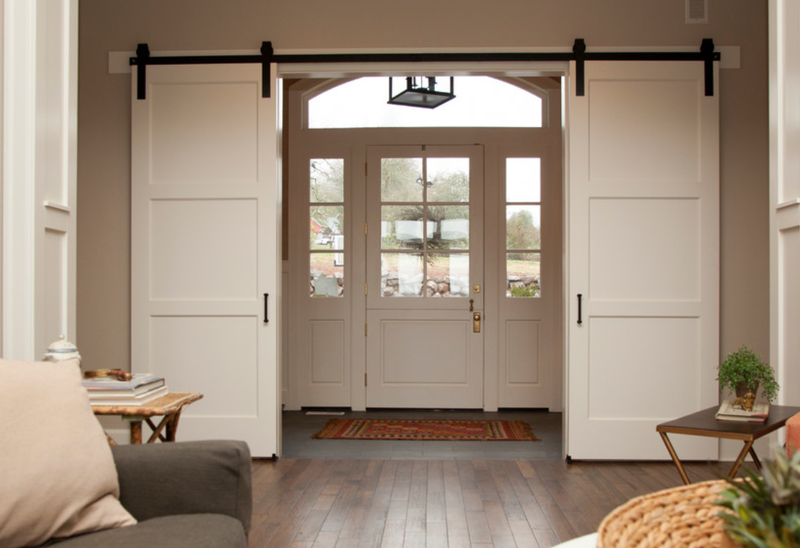 Two large rooms can be closed off with barn doors or a room where a door would look weird, looks great with barn doors. Check these out! Here is a perfect example of closing off a whole room. This darling little loft apartment is made more private with the addition of a barn door. Great use of the sliding doors in this kitchen. Imagine regular doors opening every time you went into a pantry or broom closet. Plus, I really like the look of these doors. They can be treated as another wall feature for sure. Love the ability to close off the whole room. Cute doors here, very barn like. A little bit of a classy look here. Nice way to get a little extra privacy from the windows around the door or even a great way to conserve heat in a house. This is one of my favorites It’s just so white, and clean, and fabulous. 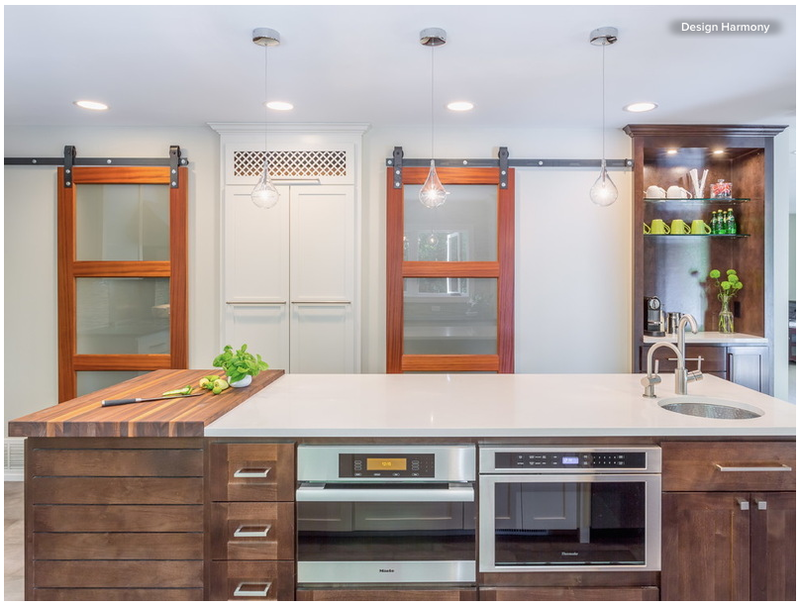 So, all these pictures came from the Houzz website I told you about on Saturday. The little green tags are places you can tab over and they will tell you where the products are from or where you can purchase them. We have a fifth bedroom downstairs in our house that we have used as a bedroom, guest room, and office. The biggest dilemma about the room is there is no door. It has a large opening and we can’t put a door on it. The door way has no door jam. 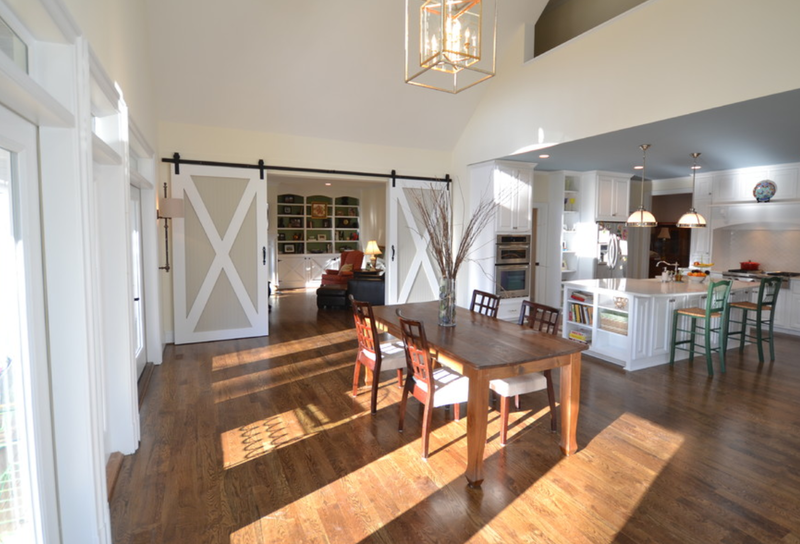 So, wait for it… That’s right, this is a perfect room for a barn door. I feel like I’ve finally, after 13 years, figured out how to solve the privacy problem with this room. We’ve used a privacy accordion screen, and different curtains, but everything looks cheesy and messy. So now, the idea of a barn door set up wins! Stay tuned to see what we decide to do.